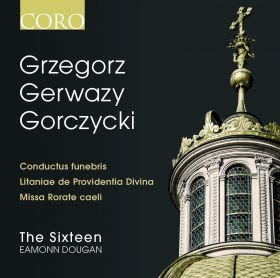 Three superb recordings give us music in Prague in the 16th century, and two Polish masters, Nikolaj Gomolka and Grzegorz Gorczycki (with The Sixteen once again!).. I. Audite, Gentes! : Psalms of the Golden Age. Accord CD ACD 214-2. Mikołaj Gomółka’s Melodiae na Psałterz Polski (published in 1580 as a setting for Jan Kochanowski’s poems and dedicated to the Bishop of Cracow – Piotr Myszkowski) is probably one of the most important works in Polish music. From one point of view it is a work of tremendous originality (due to magnificent, innovatory lyrics in Polish), and from the other, a result of the most up to date and fashionable, contemporary European trends and musical currents. 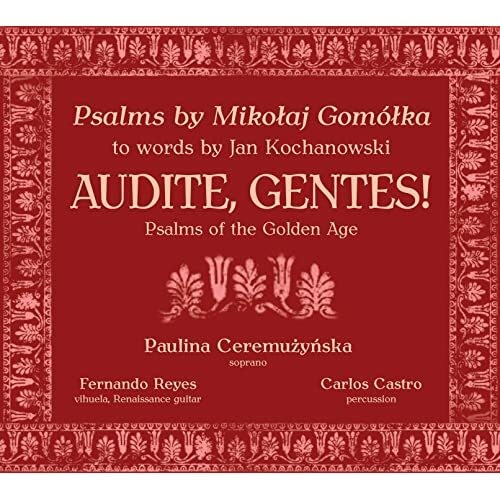 Seemingly simple in terms of style, psalms by Gomółka are a real collection of various musical forms from villanesca or villancico to frottola, canzonetta, villanella, etc. The style of these (usually homophonic and intended for more than three voices) pieces incorporates into its own form other forms, which can be referred to as more instrumental, such as dances that were popular at that time: chaconne, folia, bergamasca, canary, passamezzo, etc. The performance practice of all of these forms, including psalms obviously (and “canzonette spirituale” and other similar forms), gave the performers much more freedom than it might currently seem by taking a cursory look at the score. The score of each psalm is a suggestion, creating possibilities for countless interpretations: for four voices accompanied by lute, organ or other instruments; for solo voice accompanied by lute, vihuela or other harmonic as well as melodic instruments… Naturally, the psalms can also be performed with the accompaniment of percussion instruments (since in many psalms we recognize the presence of dance forms). In addition, Gomółka’s Psalms can be accompanied by “ritornellos” or preludes in form of these dances, which are incorporated in them in more or less concealed way. The possibilities of interpretation of this unique opus are vast. The lute arrangement (we use here the word “lute” to refer also to instruments such as vihuela, renaissance guitar…) is the one that lets us approach the text most closely and the one that stirs the emotions most. II. Grzegorz Gerwazy Gorczycki (The Sixteen directed by Eamonn Dougan). Coro CD 16130. Like his predecessor Bartłomiej Pękiel (COR16110), Gorczycki wrote in both 'stile antico' and 'stile moderno'; the works featured in this recording display his skill in both genres. The Missa Rorate shows his mastery of counterpoint and sensitivity to word-setting, as does Illuxit Sol in which Gorczycki revels in the rhetoric of the text, painting it with lush five-part string writing; Conductus Funebris, a four-movement work setting text from the Burial Service, marries his contrapuntal skills with a more emphatic, declamatory style, while in the Litania de Providentia Divinae, Gorczycki unleashes the full power of his invention as he paints the virtues of "Divine Providence" with a glowing palate of colours. III. Praga Magna (Capella Mariana/Vojtěch Semerád). Artevisio/Supraphon CD AV-0001-2. At the end of the 16th century, Emperor Rudolf II summoned the finest artists to his residence in Prague, thereby transforming the city into one of the most important cultural centres in Europe. Court composer De Monte, who entered the service of the Habsburg emperor in 1568 after travels in Italy and England, was at that time one of Europe’s most renowned musicians. His 8-voice Missa Confitebor tibi Domine originates from that period. 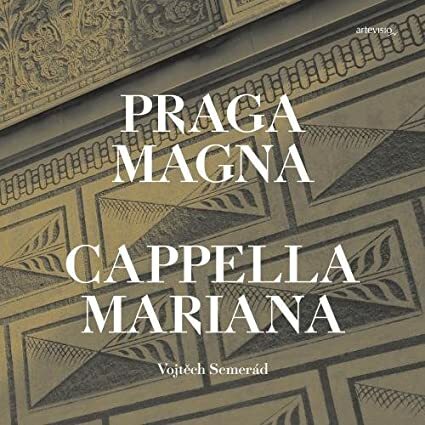 The Prague ensemble Cappella Mariana presents De Monte’s mass alongside several of his madrigals and works by his colleagues Zanchi and Regnart. From Fabrice Fitch: The reign of Rudolf II (1576-1611) marked the zenith of Prague as an imperial capital. But whereas Rudolf’s patronage of the fine arts (and occultists of all stripes, for that matter) is the stuff of legend, his interest in music seems to have been limited. From his father and predecessor he inherited his chapel-master Philippe de Monte, and of all the contemporary musicians of comparable standing, Monte is arguably the least striking. Put another way, there were others active in Prague (Jacobus Gallus springs to mind) whose output might seem to us more in tune with the eccentric, eclectic atmosphere of Rudolph’s court. So the decision to illustrate its music on this recording with almost exclusive reference to Monte, while logical, somehow feels like a missed opportunity. Perhaps it’s Monte’s apparent reluctance to engage with the structural potential of musical rhetoric that makes his music difficult to grasp nowadays. It’s unimpeachably well made, and its own reluctance to draw attention to itself might be considered a positive attribute. When performed as sympathetically as here, it is very enjoyable to listen to (the two Italian madrigals included here particularly so). Cappella Mariana use solo voices and instruments (cornetts, sackbuts, organ and theorbo). The overall sound is well blended, the individual timbres are most attractive and the sense of dedication and commitment is obvious. Does the music need grabbing yet more forcibly by the scruff of the neck? I still wonder; but don’t hesitate to puzzle the thing out for yourself. Alessandro Orologio, Jacobus Regnart, Giovanni Pierluigi da Palestrina, Liberale Zanchi, Philippe de Monte, Orlando di Lasso, Grzegorz Gerwazy Gorczycki (1665–1734), Nikolaj Gomolka.